Porcini, cremini, enoki, shiitake–I never met a mushroom I didn’t like. Even the plain white button ones are a highlight of my meals. Plus I love the sound of those syllables rolling off my tongue. This week’s recipe welcomes a range of earthy flavours, textures and shapes into one big soup pot. Chickpea flour and cashew milk make the broth extra creamy. And big, chewy lasagna noodles mingle with fragrant herbs and heaps of mushrooms. Here, I used the white and cremini variety. You could also try portobello, king oyster and shimeji. What kind of ‘shrooms do you like to cook with? In a large soup pot, heat the oil on medium high. Cook the garlic and onions for about 3 minutes, or until the onions are golden. Add the mushrooms and sauté until the moisture evaporates, about 10 minutes. Add the chickpea flour, 1 tbsp at a time, and stir until the flour is absorbed. Pour small amounts of mushroom broth and keep stirring to prevent clumps. Add the lemon juice, nutritional yeast and thyme. Bring to a boil and reduce to a medium low heat, until the noodles are al dente. Stir in small amounts of non-dairy milk until thickened. Remove from heat and garnish with green onion and herbs. *If you’d like the soup to be more savoury, add tamari or soy sauce. 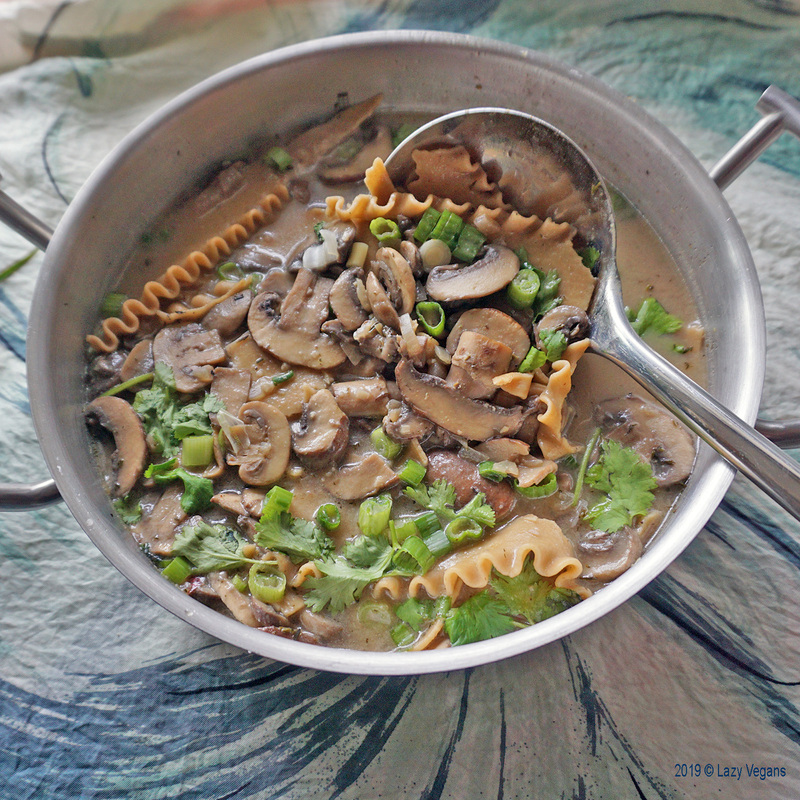 Ooh, sounds like a comforting and yummy way to enjoy mushrooms on a winter’s day! This has to be delicious! Thanks for sharing! !